A deposit of £100 is payable on booking which is refunded within 7 days of departure after your holiday upon inspection of caravan. Please pay full amount 4 weeks prior to holiday. All bed linen is included in the price for 2017 holidays. Perfect location for a relaxing family holiday or a five minute stroll to the entertainment complex on an evening. Immediate access to the coastal paths right outside the caravan which lead directly onto Cornwalls beautiful walks, then along the dunes which lead directly down to the beautiful three mile long beach of Perran Sands. 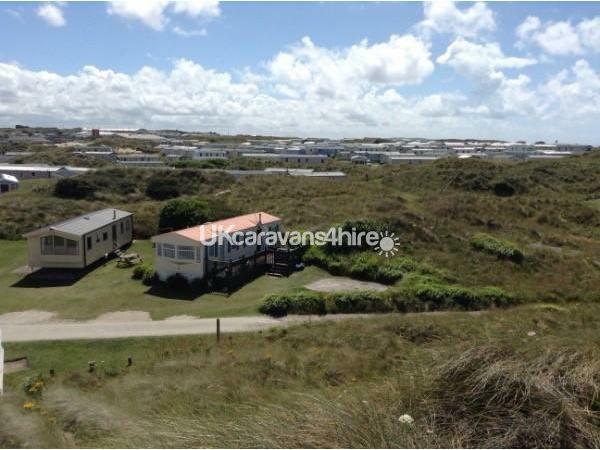 The caravan has one large double bedroom and two twin bedrooms. Plenty of seating in the lounge for the whole family in comfort on the large sofa, all have good views of the TV. Shower room with toilet and sink, heated towel rail. Guests are requested to bring their own towels. Fitted kitchen with gas cooker, microwave, kettle, toaster, sandwich toaster and fridge with freezer compartment plus dining area for six to sit comfortably. All the utensils you should require are provided even plastic cutlery for younger guests or a picnic basket to use and enjoy. Lounge with flat screen T.V, Free view, DVD player and stereo. Tea towels are not provided however dish cloths and cleaning items are provided. A Vacuum cleaner, spare blankets and board games are provided for your holiday period. Provided for your convenience is an ironing board and iron should you need it. Hairdryer is also available. Duvets and pillows are also provided and all bed linen with beds made up for your arrival. 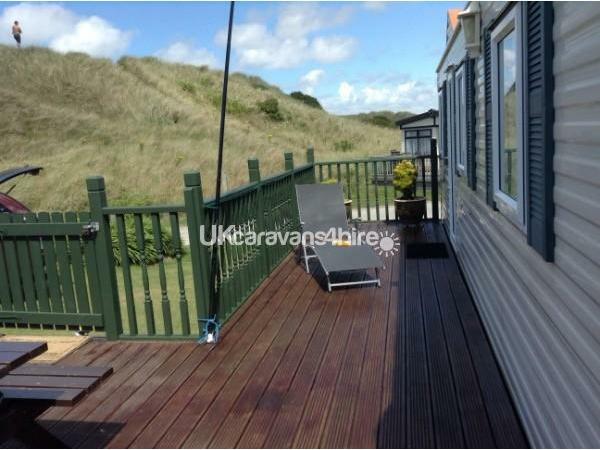 Decking area at side of the caravan with picnic table for outside dining or simply enjoying the views! The caravan is strictly no smoking and no pets. Outside tap is available to wash of your wetsuits and boards before relaxing on the decking for the evening. A private location for sunbathing or relaxing in comfort, quiet and peaceful so you wont be disturbed by others but only a five minute walk to the entertainment complex. Lovely clean and spacious van in a quite corner of the park. This caravan has a nice homely feel to it with all the amenities you should need for your stay. Nice location ensures you are not disturbed at night when the clubhouse entertainment finishes, pleasant 5 minute walk to all the parks entertainment in one direction and pleasant 5 minute walk in the other direction to the beach. Would recommend this caravan to those who enjoy all the fun that the park offers but like to escape to somewhere quitter to relax.